Pyramid Mountain, near Boonton, NJ, is host to numerous hiking trails in the rugged New Jersey Highlands along the western edge of the Newark Basin lowlands. Pyramid Mountain rises to 920 feet above sea level. Beautiful views of the Manhattan skyline in the distance to the east is one of the rewards for climbing one of the steep trails to the top of the mountain. 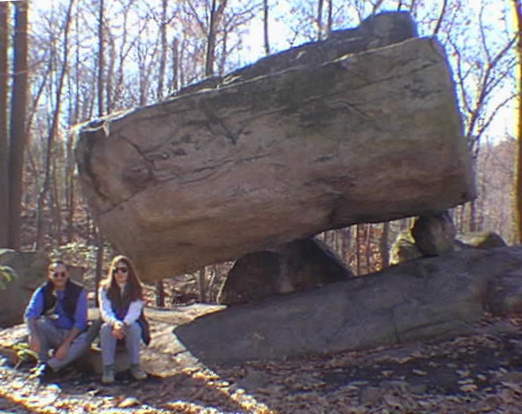 Tripod Rock, an unusually large glacial erratic (giant boulder) sits on top of three smaller boulders. The arrangement of the boulders is quite unusual. There is speculation that the site might have archeological significance (such as a winter solstice marker, but this is probably wishful thinking...). No doubt humans have modified the site in the past. Tripod Rock is just one of several truck- to house-sized boulders left behind by the melting glaciers. Two others along the mountain trails worth seeing are Bear Rock and Whale Rock. 1. Differential erosion of the hard, fractured gneiss of the highlands in relation to the softer sedimentary rock of the Newark Basin. 2. Possible uplift of the Highlands region along the Ramapo Fault system. This fault may have been active since Precambrian time, with different directions of relative motion along the fault in different periods of its history, including our modern times since the glaciers have melted. A new visitors center for the trail system is next to a large parking area on the west side of NJ Route 511 about .8 miles north of the intersection of Taylortown Road. (NJ 511 runs north out of Boonton.) Trail maps are available at the visitors center. Wear rugged shoes! It is muddy in places. Definitely plan for a long hike (with water, pack, and snacks).